Inspired by the movie Polar Express, this quality gift bell is a large #3 (37mm, 1.46″) sand-cast antique-styled brass petal bell plated with a silvery nickel for a shiny, bright finish. Use the red leather strap to hang on your tree as a surprise Christmas gift, or give it to a child so they may “Believe” in the magic of the season. 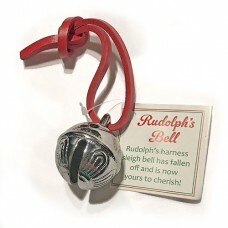 This quality gift bell has a big, bright sleigh bell tone that is sure to delight. You can use the red leather strap to hang the bell on your tree as a surprise Christmas gift, or give this gift bell to a child so they may “Believe” in the magic of the season. Additional discounts for multiple purchases (more than one piece at a time). Ships in a beautiful gift bag. Not suitable for children under the age of three.